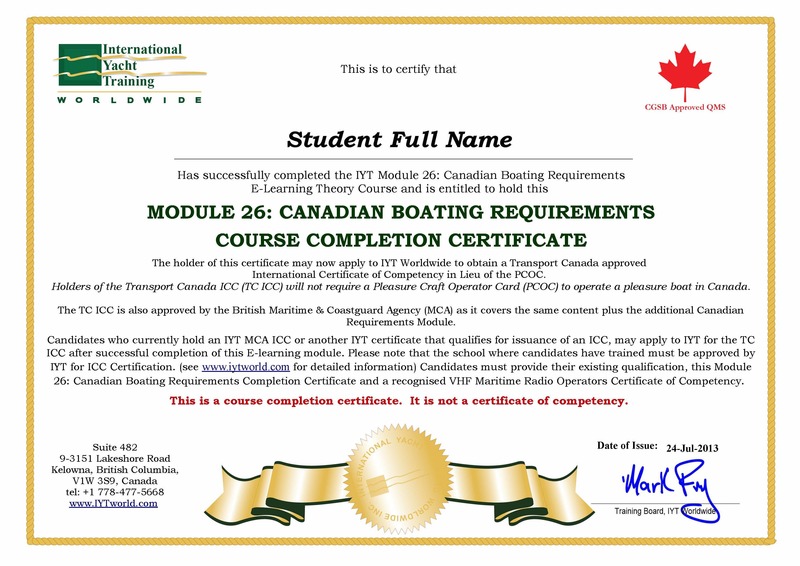 Welcome to the IYT Module 26: Canadian Boating Requirement course. The information contained in this course is provided free of charge in order to promote international boating safety. To take the free course and gain a thorough knowledge of Canadian Boating Requirements, you simply need to register with IYT and pay a $0.00 invoice which you will be prompted to do. Pay $25.00 USD fee by credit card or paypal. Complete this E-Learning course, all quizzes within the course and the final theory examination. When you have successfully completed all of the steps noted above, you will be able to print the Course completion certificate (pdf version) and/or refer to this certificate which will appear on your IYT account profile. Candidates who currently hold an IYT MCA ICC or another IYT certificate that qualifies for issuance of an ICC, may then apply to IYT for the TC ICC. Candidates must provide their existing qualification, this Module 26: Canadian Boating Requirements Completion Certificate and a recognised VHF Maritime Radio Operators Certificate of Competency.